April 9, 2011. 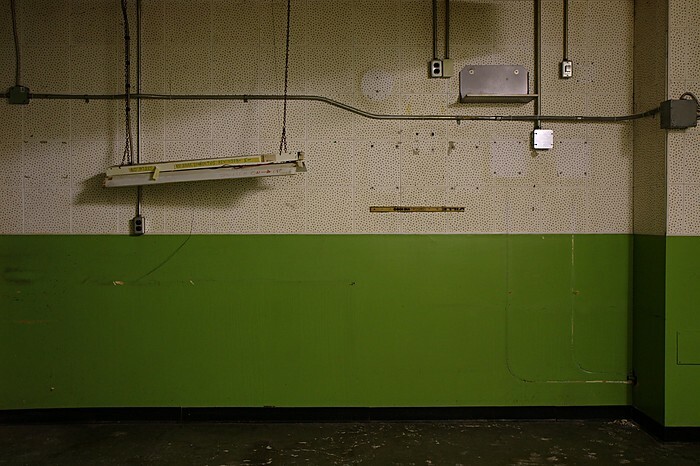 Inside a projection room of the former Westwood Theatre at Six Points in Etobicoke. This place has been pretty much stripped bare, but it still provides an interesting high-up view into the theatres, which you don't normally get. There's a cool bit of Canadiana here: A piece of an old Victoriaville Custom Vic 1000 hockey stick is bolted to the wall, which I only noticed after taking a closer look at the photo a day after shooting it. Victoriaville hockey sticks are no longer made. Due to their strength and rigidity, I've seen busted hockey sticks find second lives in bike trailers, fence posts, benches, and more. April 9, 2011. 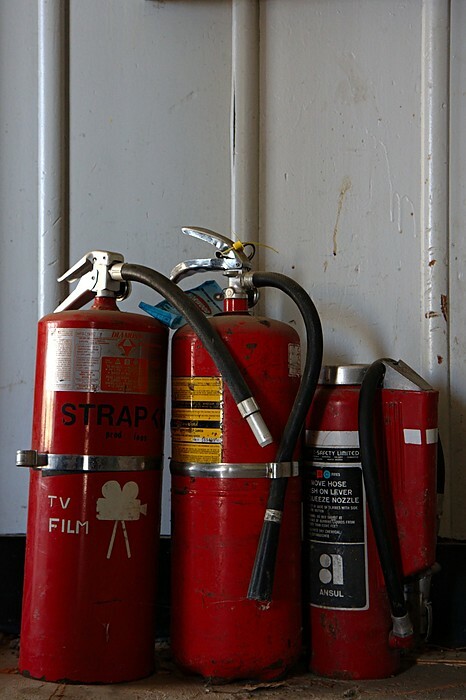 A set of fire extinguishers inside of the abandoned Westwood Theatre at Six Points, Etobicoke. April 9, 2011. 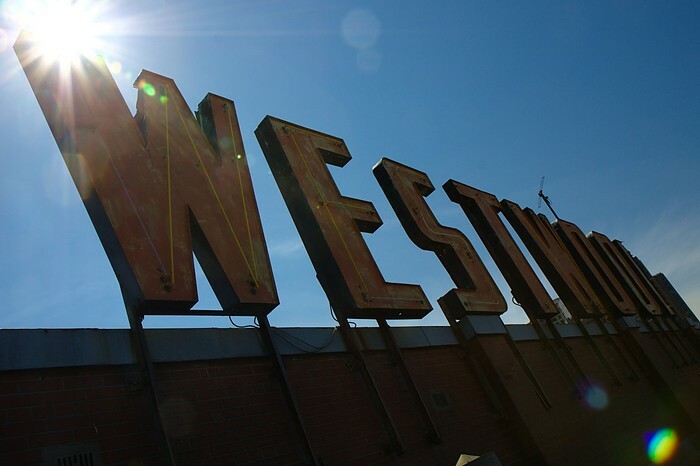 California has the "Hollywood" sign, Etobicoke has the "Westwood" sign. Though not nearly as monumental, this former theatre's rooftop sign is a bit of a landmark in Toronto's west end. As condos sprout all around the Six Points interchange (where Kipling Ave, Bloor, and Dundas Streets all meet and tangle into a pile of asphalt), the Westwood Theatre sits vacant and stripped of most of its interior, waiting for the land to be redeveloped. The Ontario government was planning on building a new provincial courthouse here, but this plan was scrapped in the most recent budget. Penny Farthing on Dupont St.
April 8, 2011. 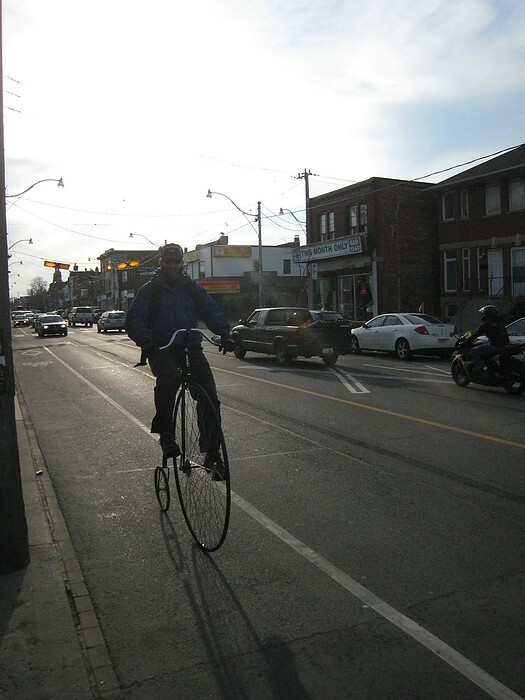 I spotted this penny farthing bicycle riding on Dupont St. at Perth Ave. I saw this guy (I assume it's the same person) a couple of years ago on Campbell Ave., and someone else recently reported another sighting on Twitter. So I'm glad I had my little camera with me to get this snapshot. Next time, I hope to flag him down for a chat. I'd love to know where he got the bike, and of course I'd fancy taking this highwheeler for a spin. Try your war on graffiti? April 8, 2011. A new tag on the stairway up to the Bloor GO station. 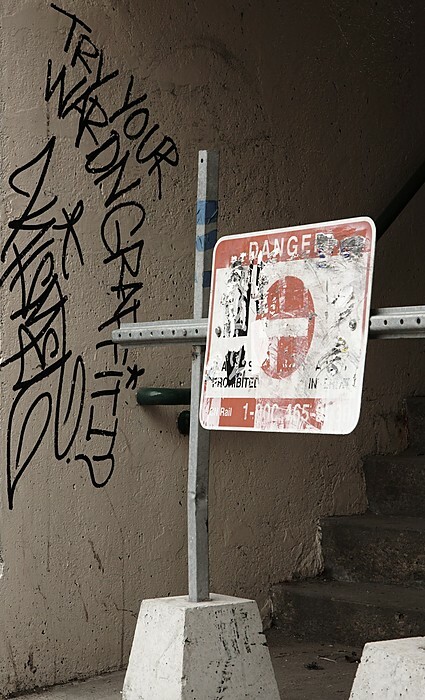 Kismet says, "Try your war on graffiti?". This is likely in response to all of the graffiti cleanup (and goofy mayoral photo-ops) happening all over the city, including right here. I'm sure it'll be an interesting cat-and-mouse game for a while. On that note: I'll be leading a "Jane's Walk" around our neighbourhood on Saturday May 7th. 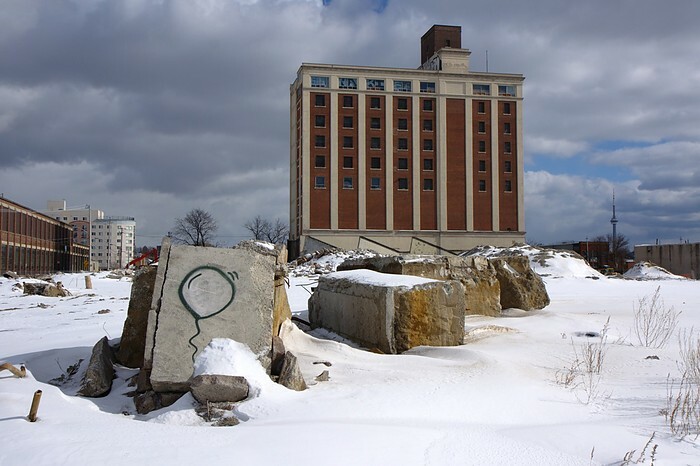 We will explore and discuss various forms of public art around the Junction Triangle neighbourhood, including murals, street art, ghost signs, etc. 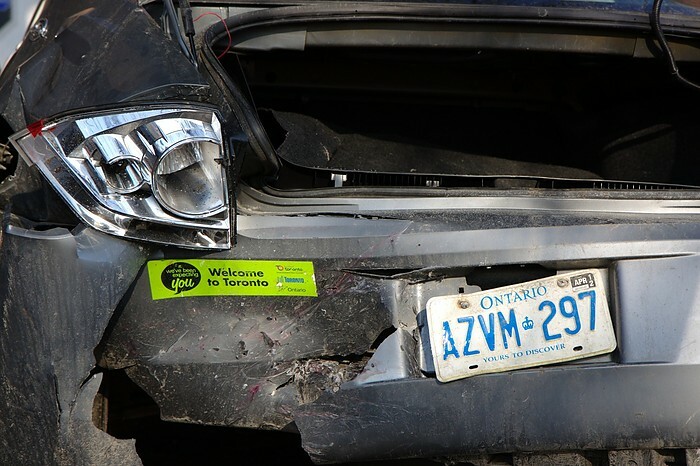 More info about this walk is on the Junction Triangle website. Welcome to Toronto. We've been expecting you. March 1, 2011. Perth Ave., just south of Bloor St.
February 12, 2011. A balloon, the former Tower Automotive building, and the CN Tower, looking east from the West Toronto Railpath. This balloon graffiti has been showing up all over our 'hood, especially along the Railpath, and apparently all over the city. This plot of land has undergone many changes over the last couple of years, and it will be interesting to see what it gets re-developed into. February 10, 2011. Out for a walk on a sunny Thursday afternoon. 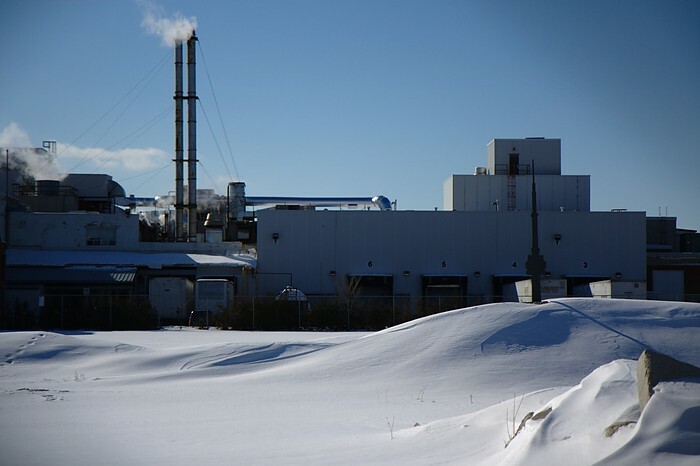 This is the view from Lansdowne Ave. over the barren former TTC streetcar yard on Lansdowne Ave., across to the Nitta Gelatin factory. There's also a CN Tower in there if you look closely. February 10, 2011. The railway tracks around the Junction Triangle can be great places to go for a walk, even though you're technically not allowed to be here. 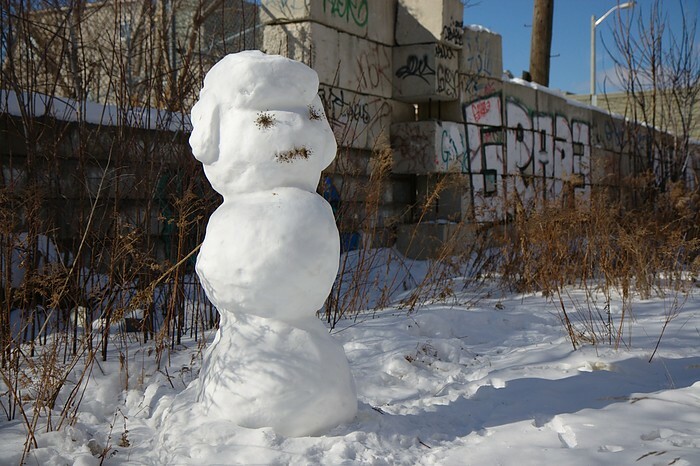 It's not unusual to find plenty of graffiti and illegally dumped garbage along here, but sometime I come across other unexpected things like this snowman. This was taken on the Newmarket/Barrie tracks at Paton Rd. No, definitely not pigeons for breakfast. Out for a walk on the morning of February 2, 2011. Bloor St. just east of Symington Ave. 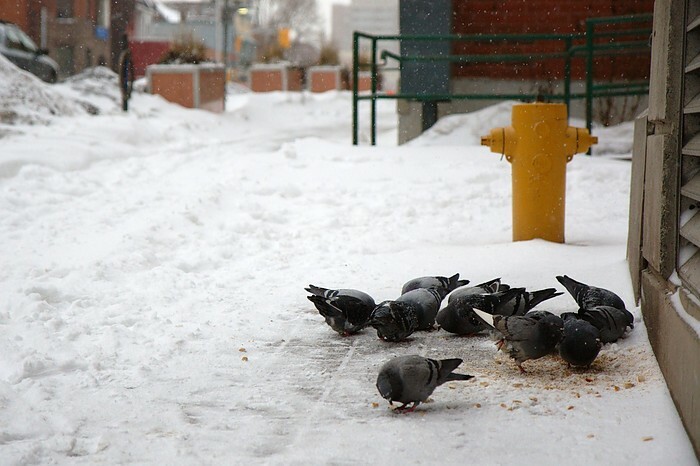 Someone frequently leaves food here for the birds. It's actually kind of gross most of the time: It looks like piles of leftovers get dumped here, probably feeding the rats and raccoons just as much as the birds.